At Maplehust Elementary, we recognize that enduring excellence is attained only through honor and strong character traits. Honesty, respect, and responsibility are essential traits of good character and are important to the learning process. The purpose of "School Rules" is to establish and uphold high expectations for student success both in academic work and in character development. 1. Accept the leadership and authority of teachers, principal, and other staff members. 2.Show respect for school and personal property. Refrain from damaging, defacing, or destroying school or personal property. 4. Cooperate with teachers and other pupils. 5. Be regular and punctual in attendance. 6. Practice habits of good health and cleanliness. 7. Dress appropriately and neatly. 8. Be honest and courteous. 9. Use acceptable language--no profanity or obscenity. 10. No chewing gum or eating candy. 11. Obtain authorization from school officials before using telephone. 12. 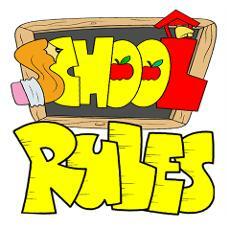 Remain on school grounds until dismissed or given permission to leave. 13. Walk and speak quietly in the hallways. 14. Assist in keeping the grounds free of paper and other litter. 15. Behave in an acceptable way to and from school. 16. Keep hands to themselves at all times.